Key Difference: Water is a unique substance that covers about 70 percent of the earth’s surface, and it is essential for almost all life forms. 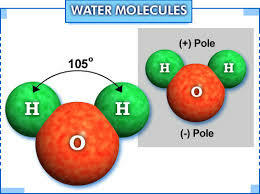 A water molecule is formed by the combination of two atoms of hydrogen and one atom of oxygen. Ice is the solid form of water. It is formed when water freezes. 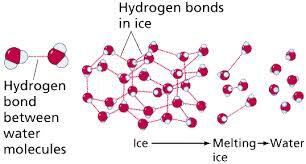 Ice is less dense than its water form. Water is a unique substance that covers about 70 percent of the earth’s surface, and it is essential for almost all life forms. Another important feature which sets it apart from the other substances is that, it is the only compound that exists naturally in all the three forms, namely liquid, solid and gas. Pure water has prominent characteristics like colorless, odorless and tasteless. Considering its structure, one can call it a polar molecule. One molecule of water is formed by the combination of two atoms of hydrogen and one atom of oxygen. These atoms bond covalently to form water. In water, the charge is asymmetrically distributed and due to this reason the oxygen atoms are capable of attracting the electrons in a more powerful manner than the hydrogen atoms. Due to its polar nature, it mixes or dissolves easily with many other substances. The melting point of water is 0 ℃ and its boiling point is 100 ℃ (at standard pressure or 0,987 atm). Ice is the solid form of water. It is formed when water freezes. It is also colorless like water. However, it can also be opaque or bluish white in color. Water in the form of ice also exists naturally. Ice has a rigid lattice structure. Water freezes into ice after getting colder than 32 degree Fahrenheit or zero degrees Celsius. As the temperature drops, the molecules of the water tend to loose the energy. In this process of loosing energy, it becomes easier for the molecules to associate with each other. This association is completed by sharing electrons. When a certain number of molecules get attached to each other, they form a pattern similar to an interlocked bunch of hexagons. This pattern forms the ice. Both ice and water possess the same type of nature. Still, they differ from each other in aspects like molecular structure, density, etc. Ice is the solid form of water. It is formed when water freezes. Water is a unique substance that covers about 70 percent of the earth’s surface, and it is essential for life forms. It is formed by the combination of two atoms of hydrogen and one atom of oxygen.